Installed 1 synthetic turf futsal court of 50mm pile height for Maktab Polis, Kuala Kubu Baru, Selangor (March 2010). 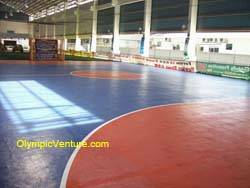 Installed 1 Fiber Reinforced Flexicourt Coating multi-purpose court - futsal, netball, sepak takraw at Sg. Ara for MSN, Penang (March 2010). Installed 2 futsal courts - 1 synthetic turf and 1 Olymflex Rubberized Floor in a car park of a food cafe, Petaling Jaya (March 2010). 1 synthetic turf futsal court at a food cafe in Petaling Jaya. 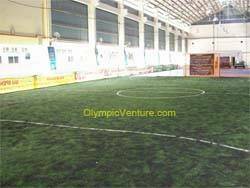 1 Olymflex Rubberized Floor futsal court in Petaling Jaya. Installed 1 Plexipave coating for multi-purpose sports court in Balik Pulau for MSN, Penang (April 2010). Installed half basketball court using coating system for a factory in Sg. Buloh (April 2010).